After the SFWA Reads Southeast event last night, a group of us headed over to downtown Durham's Dashi restaurant for dinner. Dashi is a two-story establishment that features a ramen restaurant on the bottom floor and an izakaya (basically, a sort of Japanese pub) on the second story. The night was cool, and I've been wanting to try their ramen, so we stuck to the ground floor. I'm happy to report that the entire experience was delightful. I'd read about long waits, but we were late enough that we were able to get a couple of tables right away. Everyone on staff was smiling and helpful and incredibly pleasant. The true stars, though, were, as they should be, the ramen bowls. We sampled a few different broths, and most of us also customized our bowls with some of the available add-ons. If you go there, I particularly recommend the local pork meatballs, which were simply delicious. With a range of broths to choose from and 14 different items you can add, you could eat there a great many times and still come nowhere near to experiencing all the available variations. My only complaint is that the add-ons arrived a bit cooler than the rest of the bowl. It was easy enough to fix that problem by stirring them into the broth and waiting a minute or two, but the chefs should have done that for us. I consider that a small thing, however, in the face of how delicious the bowls were. The dessert menu proved to be a small selection of ice creams from Parlour, which frequent readers (and ice cream fans) will know is the best (by far) local ice cream shop. None of these flavors were available at the Parlour store, so we shared them all among our group. I definitely recommend Dashi and look forward to going back. Earlier tonight, a group of writers gathered for a panel discussion at a very nifty space, The Edge, in Duke's Bostock library. 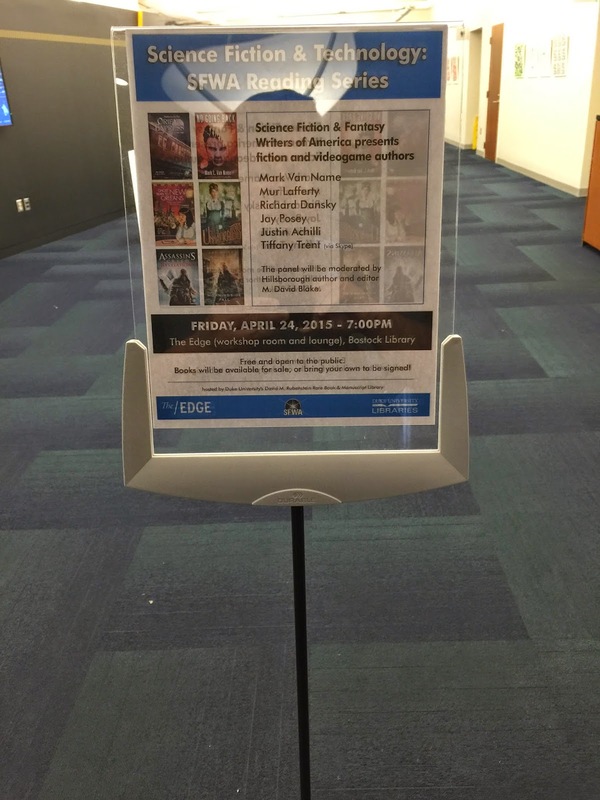 A surprisingly large audience, 28 folks, turned out on a lovely spring Friday night to hear us read for a few minutes and then discuss a wide range of topics related to gaming, technology, and science fiction. We talked about AI, graphics, game design, epidemics, self-driving cars, your inability as a writer (or any artist) to control what people take from your work, and many other things. The folks in the audience seemed involved, asked good questions, and stayed for an amazing 90 minutes. My thanks to all who came. ...Ex Machina. I love the odd vibe from the trailers, and the topic is certainly one from the (tech) news. If you're serving people in their fifties and older, and you really want to piss them off, then by all means refer to them as "young lady" and "young man." This works particularly well when you're ten to thirty years younger than they are, so that your very presence helps make the point that even as you're faking sincerity the whole comment is patently fake. Really, there's nothing older people want more than for you to remind them that they're old. Okay, maybe somewhere someone enjoys this sort of fake compliment, but the people I've eaten with most certainly do not. Doing it to me is a surefire way to start the tip meter on a fast track downward--and I am in general a very good tipper. Yes, this happened to a group of us recently, and, no, none of us enjoyed it. and catch a bunch of SF/F writers, including me, yakking about all kinds of stuff at the launch of the SFWA Southeast Reads series. More details are available in this earlier post. We'll be discussing gaming, technology, science fiction, and pretty much anything else you'd like to hear about; SF/F writers tend to have opinions on every damn thing. Afterward, we might campaign for world peace, or we might just grab a drink, a burger, and some ice cream. I'm betting on the ice cream. I grew up in Florida in a house with no air conditioning and no ceiling fans. I remember stretching out on my bed and praying for enough of a cool breeze that the sweat would stop pooling on my stomach. At the same time, I disdained those who required AC, thought them wimps. Today, I am one of those wimps. I love air conditioning. I consider it vital to survival in the south--and anywhere else it gets hot. So when the heat pump that serves my bedroom stopped putting out cool air, I had several bad nights of sleep until a repairman could come today. I'm now happy to report that the problem was a dead capacitor--not a cheap thing to replace, but nothing like having to buy a new heat pump, either. The incident reminded me of how easy it is to become accustomed to luxury, how quickly what we perceive as problems reflect what we come to expect. Part of me would like to report that as a result of this reminder I am sleeping with the window open and returning to the toughness of my youth, but I'd be lying. Instead, I've cranked the temperature down and will be enjoying a lovely sleep in a cool, dark room, happy to have my air conditioning and certain that the younger me would have appreciated it, too. In an earlier post from TEDActive, I praised the talk of Nobel Peace Prize recipient Kailash Satyarthi. Though Satyarthi is not the most dynamic presenter, I found his talk powerful and moving. Predictably, his pitch that you can use your anger to accomplish great things resonated with me. Now, you can see the talk. To steal a phrase from TED, it's worth watching. I hope you find it interesting and rewarding.